In a recent post we considered the changes in our landscape that have occurred as a result of climate change. In this post we examine more historical sources of change in the landscape. After the arrival of the Spanish in the late eighteenth century, cattle and sheep grazing was the predominant economic activity in California and continued to be an important activity into the early 20th century. These early ranchers also introduced non-native grasses which had greater nutritional value for their herds. The non-native annual grasses out-competed the native bunch grasses, resulting in California grassland that is 99% non-native today (3). So, if the succession of grassland to shrubland is natural, why do managers of public lands believe it is necessary to prevent—or even reverse– this succession? Serpentine Prairie. 500 trees were destroyed, including many oaks. 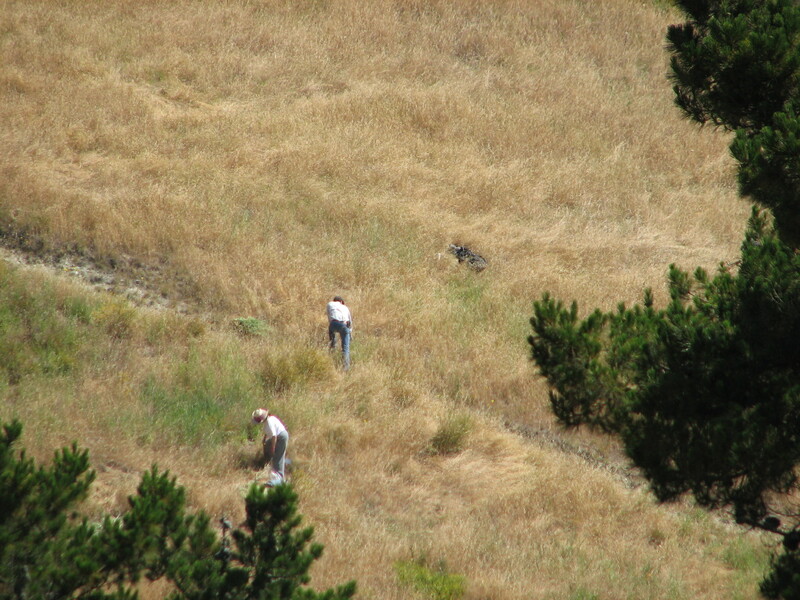 Serpentine Prairie being weeded by hand. Mowing will be required during the restoration. Prescribed burns will be required to maintain it as prairie. The return of the existing landscape to earlier, historical versions requires the removal of native trees and shrubs, as well as dangerous, polluting prescribed burns. In so doing, a permanent commitment to periodic prescribed burns is made to maintain the landscape as grassland. And what will this accomplish? If this strategy is successful the landscape would be returned to a version of the landscape in the late 18th century, even though that landscape was actually created by the Native Americans and maintained by subsequent grazing by early European settlers. As we often do on Million Trees, we ask the managers of our public lands to explain their strategy for artificially maintaining our landscape at an arbitrarily selected point in time. Should we run the risks of prescribed burns for the sole purpose of replicating an 18th century landscape that was created by Native Americans? Since California grassland is now almost entirely non-native, what is the point of preventing its succession by destroying native plants? We don’t understand what would be accomplished by such artificial manipulation of the landscape. (1) “The Use of Fire by Native Americans in California,” M. Kat Anderson in Sugihara, Fire in California’s Ecosystems, 2006. (2) “Central Coast Bioregion,” Frank Davis & Mark Borchert in Sugihara, Fire in California’s Ecosystems, 2006. (4) “Fire history of the San Francisco East Bay region and implications for landscape patterns,” Jon E. Keeley, International Journal of Fire, 2005. This is an interesting article and convinces me (again) of the futility of attempting to restore native-plant landscapes. Managers of public land need to think about the future, and the type of vegetation that will best survive as this area becomes warmer and drier. Killing vegetation and burning are two more enemies of earth’s atmosphere. California’s forests are endangered already, without cutting more trees and dousing the soil with herbicides to prevent re-growth. And don’t forget, we ALL wind up drinking the water. Wel… you could take your logic further and ask what the point is of protecting anything? Introduction of invasive plants is a change… so is introduction of extra CO2 into the atmosphere, etc. I don’t think it makes sense to manage to keep a place static to a certain date either. But I do think we should try to keep the most egrarious threats to ecosystems (ie: invasive plants, overgrazing, pollution) out of these ecosystems when we can. You do bring up good points about keeping shrubs out of grassland, etc. Maybe invasive plants WON’T completely destroy native ecosystems. Maybe emitting CO2 WON’T cause climate change. etc, etc, etc. Once we decide not to act, though, we soon lose the opportunity to do so as well. Looking back if invasive plant removal turns out to be futile, we may feel that we wasted money that could have been spent on, i dunno, a bunch of Big Macs or more Iphones. Looking back if we do nothing, we may realize that our ecosystems are gone and nothing will replace their complexity and beauty on that land again for the next 10,000 years. It’s an easy choice for me even though the issues themselves are so complex. Philosophers call this debate strategy reductio ad absurdum: “refutation of a proposition by demonstrating that its logical conclusion is absurd.” In reality, there is a wide range of alternatives between doing nothing and attempting to return to some arbitrary point in time in which conditions were radically different. 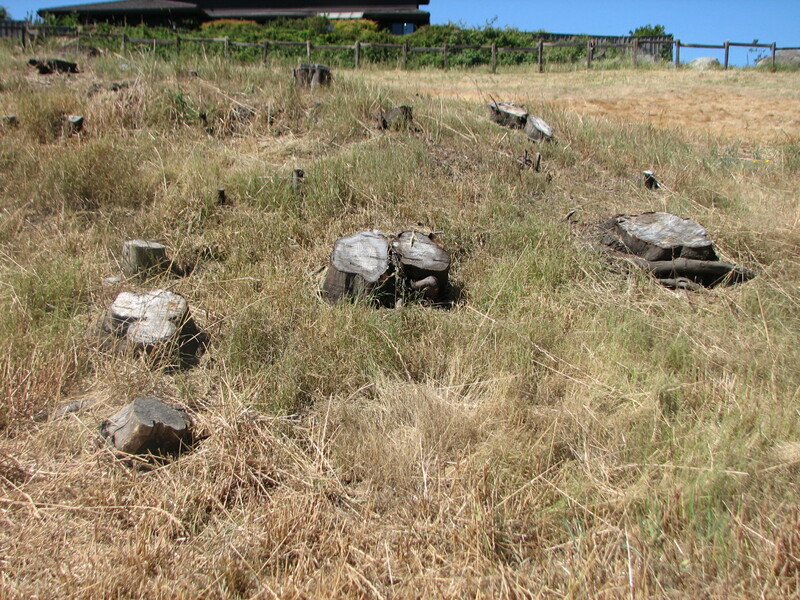 If by “invasive” Charlie is referring to non-native plants, his desire to be rid of them is not relevant to this post because the restoration examples in this post all describe the destruction of predominantly native plants. Once again, there are many worthwhile uses of public funds other than Big Macs or iphones. Education—which is now inadequately funded—would be an obvious example of a worthwhile use of public funds that wouldn’t damage the environment with prescribed burns and herbicides. Is there such thing as Expando Ad Absurdium? I feel like you are going the other way with this… it is impossible to remove black mustard and wild oats from the landscape, therefore we should not attempt to remove any invasive plants. Yes, there are some species that are not possible to remove anymore, but that doesn’t mean that all invasive plants should be allowed to ravage every last place we have left. I don’t see removing a few noxious weeds as trying to return to any time in the past. It is us removing an egregious form of pollution from the landscape so it can go back to functioning like a million year old ecosystem instead of a patch of ruderals. Webmaster:We are unaware of any projects that propose to remove only “a few noxious weeds.” Most projects intend to remove all non-native plants, whether they are invasive or not. I’m not referring to all non-native plants because as we all know, less than 1% of non native plants (in most cases) that are exposed to a new landscape become invasive. Also I am not saying coyote brush should be cleared to keep grasslands present. There’s been a whole lot of talk on this website about how invasive plants should not be removed at all. People shouldn’t be spending money on restoring ecosystems – because we need more schoolbooks! People should stop wasting money on schoolbooks – children in Africa are starving! People should stop wasting money by sending it to africa, too many people in the US are homeless! We should stop wasting money on the homeless, when our essential ecosystems are being destroyed! etc, etc, etc. Rather than squabbling over the breadcrumbs and having charities and environmental organizations fight over the meager pickings leftover from corporations and such, we should be doing ALL of the above, and more. I just don’t buy that the tiny fraction of the GDP spent on removing invasive plants is the reason education is underfunded. It doesn’t make sense! webmaster: Cost estimates for projects are rarely provided unless there are applications for grant funding. 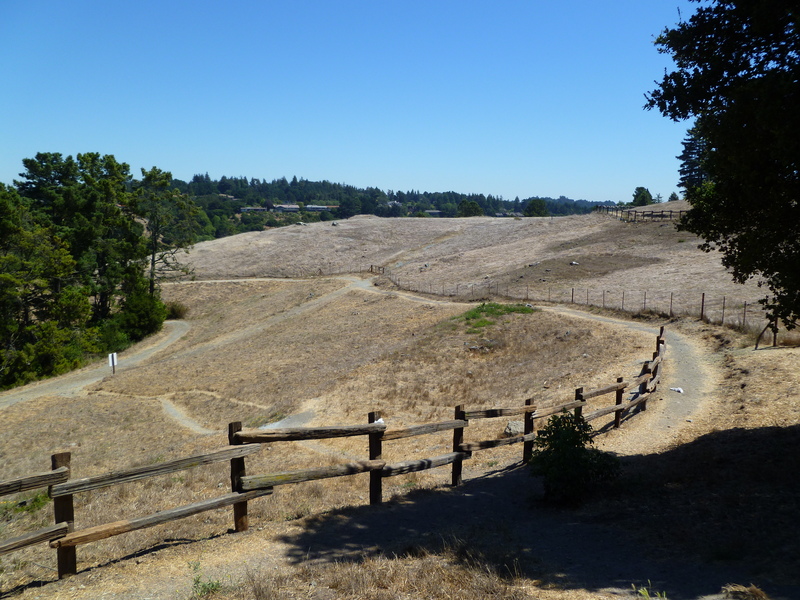 But to give our readers an idea of the cost, one project in the East Bay proposing to remove all non-native plants from 350 acres applied for $4 million of federal funding. The grant will pay only for the destruction of non-native plants and trees and the initial poisoning of the tree stumps. Subsequent maintenance such as repeated applications of poison on resprouts and any planting of native plants are not covered by the grant. 1) This comment assumes that these species will take over the world instead of that one localized micro-enviroment. This is not an assumption supported by either history or logic. 2) George Bush believed that doing SOMETHING in Iraq and Afganistan was better than doing NOTHING. He was wrong too. 3) The “i” in iPhone is not capitalized. Try a new grammar checker or fact checker. The fire ecology is part of the natural evolution of our area. The natives controlled burns were an example of working with nature and rational land management. So far the fire suppression, grass lands model has caused us a lot of problems including harsher uncontrolled fires. There is every reason to adapt a land management tactic that limits the need for grazing, cutting and fire suppression. In no way will it ever look like going back in time, but we can learn from those who did a better job than we do now. See our post “(UN)controlled burns” (https://milliontrees.wordpress.com/2010/05/27/uncontrolled-burns/) to read about the many prescribed burns that have caused wildfires. Keeley has done some amazing work on fire and based on my observations as well as those of many experts I have talked to, he is absolutely right. However, he is talking exclusively about chaparral and coastal sage scrub. Nothing he is saying applies to coastal prairie, ponderosa pine forest, redwood forest, etc. He is doing a good job refuting the need for ‘prescribed burns’ in chaparral but honestly these papers don’t really apply to other ecosystems. Webmaster: Our quote from Keeley is from his article entitled, “Fire history of the San Francisco East Bay region and implications for landscape patterns.” In other words, he is speaking specifically about our local landscape. Extremely interesting article. It sometimes appears that the objectives are defined very narrowly – for instance, preserve grasslands even if the natural succession is to chaparral. I read another paper that talked about natural succession of maritime chaparral to oak forest in the absence of fire. [“Maritime Chaparral Community Transition in the Absence of Fire” by Van Dyke, Holl and Griffin] It noted that the chaparral gradually got taken over by bushes and trees (primarily manzanita and oak) and left to itself would become an oak woodland. It suggested that fire or similar activities would be needed to preserve the chaparral. So then the question is, why? Why not allow the natural succession to proceed? This is not a native vs. non-native issue (since all plants involved are native). It’s possible that once a decision to manage a landscape is taken, management becomes a self-justifying activity. Webmaster: Yes, that’s the question….Why? What’s the point unless it’s just man’s obsession with controlling nature…a fruitless exercise, often causing more harm than benefit. I also wonder if “biodiversity” is not being misused. It’s natural for the number of species on an undisturbed area to fall, as the most competitive plants take over. If conditions change, then new plants may become competitive as new niches open up. Edge conditions, and times of change probably offer the most biodiversity. But then again, the winners start to take over until the next change in the ecosystem.